The well-known Smurfs who were created by Belgian cartoonish Pierre Culliford happen to share their birthday year with Belgium’s landmark the Atomium. The Atomium is an internationally recognized architectural structure in Brussels that made its debut in 1958 as part of the Brussel’s World’s Fair. So, the two decided to partner up to celebrate. The Atomium features 9 large, stainless steel-clad spheres that are well above the horizon. It was agreed that these spheres would “go blue” from June through to December of this year and feature a large blue Smurf head on one of its spheres. 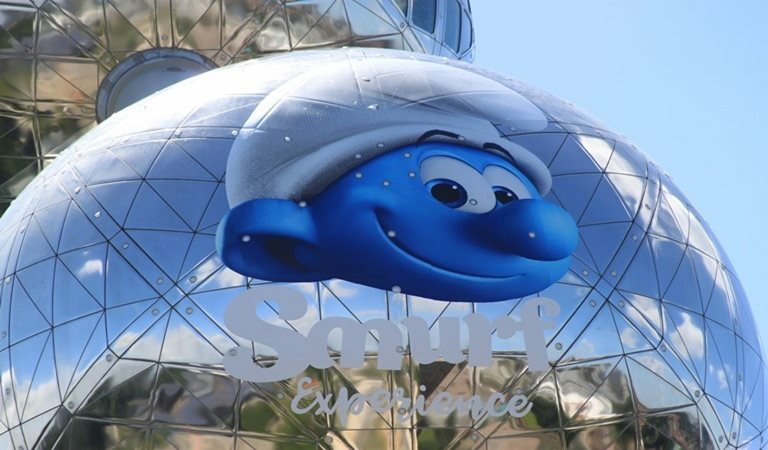 Positioned 102 metres above the ground, the graphic appears on an 18-metre diameter sphere and it promotes the nearby exhibition called the “Smurf Experience”. The Atomium’s marketing agency contacted Mactac Europe because it knew that Mactac had worked previously on a similar project where the Atomium was decorated with colours of the Belgian flag to support the country’s Red Devils national football team during the 2014 FIFA World Cup tournament. 3 Belgian companies partnered with Mactac Europe to work on the “Smurf Experience” project. The companies included Cecoforma, an agency specialising in event communications; Dynagraph who specialises in lettering and digital printing and Dizzines SPRL, experts who are accustomed to working at great heights. Dizziness usually cleans the shiny metallic orbs, however for this project they were tasked with helping install the artwork. For this extremely challenging task, both Dynagraph and Dizziness organised a team of 4 experienced climbers. Within 3 days, they successfully applied an image that measures 9 metres wide by 14.5 metres high. This was achieved by using Mactac’s digital printing and self-adhesive signage films to astonishing effect. The Smurf image features a sticker divided into 45 strips with each being about half a metre wide. Regarding the Smurf head, the partners decided to use Mactac’s IMAGin JT 5829 R, a 100µm, white intermediate vinyl digital printing media that has a removable grey adhesive that provides excellent opacity without leaving adhesive residue from common surfaces for up to 2 years after application. Afterwards, the printed image was overlaid with Mactac’s Permacolor LUV 3898 laminating film. The film protects the image against colour fading that is caused by exposure to ultraviolet light and against potential physical damage. The film also adds a clear, matte finish to the printed visual. For the lettering, the partners used the signage film MACal 8900 Pro in a white matte colour. This is similar to the Mactac’s IMAGin JT 5829 R also developed with a removable adhesive. The Atomium and the Smurfs are collaborating in other ways to celebrate their 60th birthdays. Attendees will be able to receive a reduced price when visiting the Atomium and the Smurf Experience in Hall 4 of Brussels Expo and several Smurfs collectibles are on sale in the Atomium’s gift shop. The Smurf Experience features an interactive “magic village” that covers over 1,500 square metres which promotes sustainable development. Visitors to the village can find out about the 17 objectives for sustainable development as defined by the United Nations by identifying the 17 matching objects to be found along the way. Speaking to FESPA.com about the innovative project, Patrick Winters, senior marketing communications manager for Graphics Solutions Europe at Avery Dennison, said he was “proud” to support an initiative for an iconic brand known across the world. “We are proud to be involved of this kind of project,” Winters said. “It allows us to show that our products can be customised to suit all kinds of locations, even on the most unexpected surfaces. The Atomium results show that our films can enable creativity anywhere it is needed. Having started out as a comic, the Smurfs franchise, which includes more than 100 different characters, has expanded into advertising, films, television series, video games, theme parks, dolls and even ice capades. ‘The Smurfs’ motion picture was released in July 2011 and has grossed $563.7m (€487.7m/£439.6m), while the sequel ‘The Smurfs 2’ launched in April 2013 and took $347.5m at the global box office. A third film, ‘Smurfs: The Lost Village’ took $197.2m after an April 2017 release. Mactac Europe operates as a manufacturing facility in Soignies, Belgium and were happy to assist a pair of Belgian icons to celebrate their birthdays high-flying style.